Hooray for 6 years of Omari's Sister/Crimson Flower! We were too busy playing catch up to do anything special. Oh well... maybe next year! But at least we're caught up! 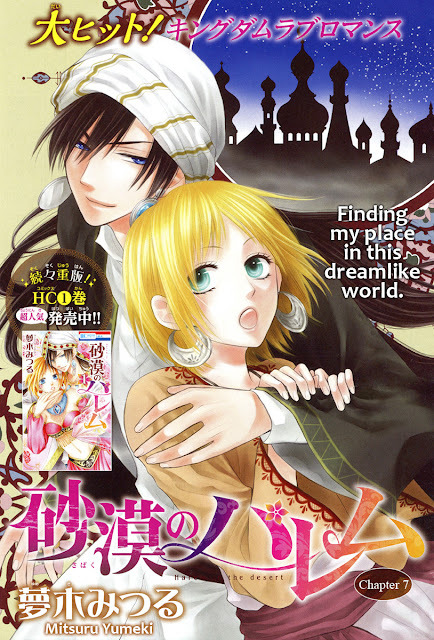 "Sabaku no Harem" keeps flirting with Lala Magazine. It makes me wonder whether Hakusensha is thinking about moving it from Lala DX to Lala. I don't want to this series to move to Lala because the print quality HORRIBLE. Lala DX is much easier to read. I did my best to make this chapter look good given the print quality from Lala. The redraws in this chapter were more insane than last chapter, so let's give a big thanks to Ichigo Stars and our new redraws artist, Amaya! Great job, ladies! This is an another comedic fillerchapter. This time Kallum and his harem are entertained by a traveling circus. Adeis is best shoujo lion. 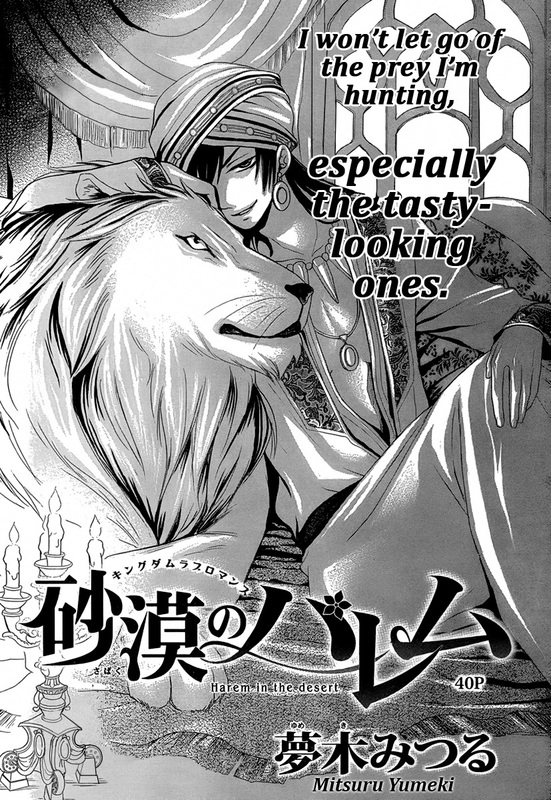 I hope to see more shoujo lions in the future. I'm still waiting for the sassy camel themed "Sabaku no Harem" filler chapter. Give it to me! Anyhow, I had fun translating this chapter, but not so much fun lettering this chapter. My bloody finger stumps are presently healing. As one of the proofreaders pointed out, it's been a long time since we've released a oneshot. Yep! It's been since February. We've been pushing really hard to catch up on our top priority monthly series, and now that we've pretty much caught up, we can start releasing oneshots again. This oneshot has been translated and sitting on the back burner for about a year. I think this may be our first oneshot from Betsucomi magazine. 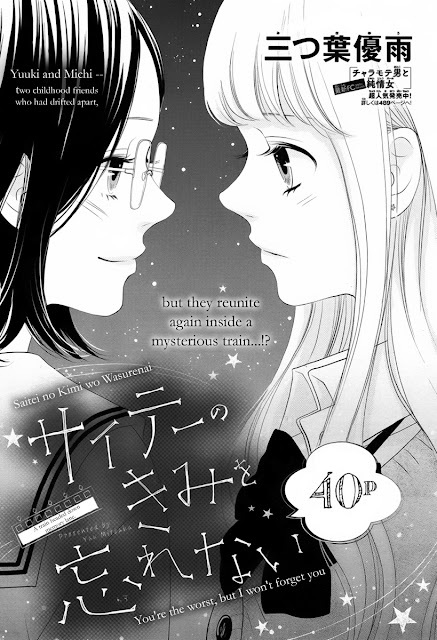 Anyhow, this is pretty straight forward girl friendship shoujo, so I don't feel the need to write my thoughts about this oneshot. For me it's nostalgic because I've been on both ends of the ignore-a-former-friend situation. Although, it's a bittersweet, I think this oneshot is very calming and pleasant read. Thanks to Peonine for a lovely translation and to our new letterer, Cortz, for completing the lettering very quickly. Summertime is coming and we're planning a one-shot and short series filled summer. We are recruiting for a couple of experienced letterers who are capable of recreating lettering effects that match the Japanese lettering. So if you want to volunteer, know clever Photoshop tricks, have some free time from the end of May until September, please send me an e-mail via link at the top right hand side of this blog.